This spring, I had the pleasure of testing out a Stafast suspension stem. The promo video is below. I was skeptical whether the kind of riding I do on a daily basis would really benefit from a suspension stem. When riding around town, I use a steel touring bike with 700c X 38mm tires. I find it to be pretty comfy as it is. However, if suspension is ever going to be an asset in navigating the mean streets of Kitchener-Waterloo, it’s going to be this year. With construction for a new light rail transit in full swing, our roads are so torn up you could ride a fatbike here without looking ridiculous. Weighing just over 400 grams, the Stafast stem was more than twice the weight of the forged aluminium stem I’d been using before. Admittedly, once I got the stem mounted, I didn’t really notice the extra weight as I was riding. One issue that presented itself when mounting the stem was interference with the cable hanger. I needed to use 30mm of spacers to ensure that the Stafast pneumatic cylinder cleared the brake housing as shown below. This is not apt to be an issue for many, as the pairing of a $350 suspension stem with cantilever brakes is a combination that is unlikely to repeat in this current era of disc brakes and consistently applied budgetary decisions. Although the recommended shock pressure for my weight and riding style is 250 psi, I opted to start at 50 psi to get a better sense of the range of suspension offered by the Stafast stem. At such low pressure, I could feel the stem squishing as I got on the bike, a feeling reminiscent of climbing into my grandpa’s Cadillac. Although novel at first, it soon became clear that more pressure was required as this flex in the suspension would occur when climbing out of the saddle or simply pushing a big gear. At the recommended 250 psi however, the stem felt really solid. So solid that it wasn’t completely obvious how much shock absorption was actually going on. I say that because my 38mm tires and aluminium handlebars also soak up a lot of shock. To be fair, when it comes to road use, it seems the Stafast stem is marketed more toward the kind of road bike that lacks these other modes of shock absorption. Over the course of the month I rode the Stafast stem, it lost about 75 psi. This wouldn’t be a big deal with the newer model Stafast stems. In the latest Stafast design, the valve is accessible right at the bottom of the pneumatic cylinder. In the early model I was using, the trunnion at the bottom of the pneumatic cylinder needed to be unbolted from the stem and then unscrewed from the cylinder to expose the valve. Although the primary feature of the Stafast stem is the suspension, another feature that should not be neglected is the option to adjust the stem angle over a range of 25°. This adjustment is done using a wrench to turn the pneumatic cylinder gland. The cylinder must be fully depressurized before performing this operation. With all this functionality built into the stem, it’s no surprise that the Stafast stem looks like some sort of military gadget. Whether you think that’s good or bad, likely says a lot about whether the Stafast stem is right for you. 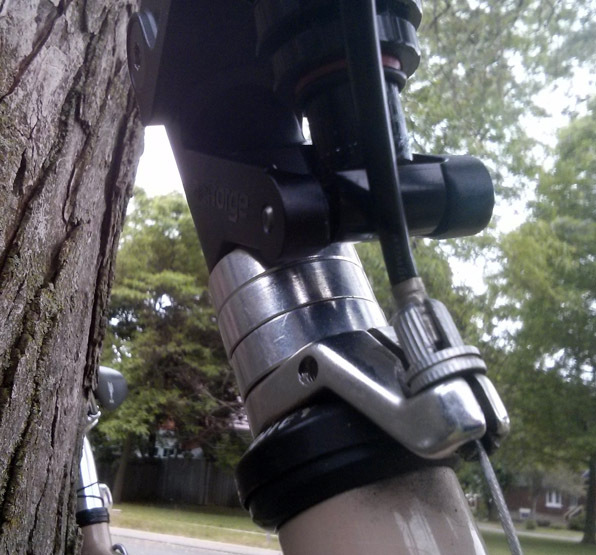 You are currently browsing the Bicycle Forest Blog weblog archives for June, 2015.